The full-length Jerry Pritchett documentary, Be Legendary, has been released on YouTube, and at sixteen minutes long, it’s the perfect length for your next lunch break. We first covered the trailer for this film when it dropped in earlier this year, and the final product turned out pretty different to what we were anticipating. But that’s probably a good thing. While the trailer dedicated an unusually large amount of screentime to Pritchett gazing at very clearly branded ALR industries supplements — it almost made the film look more like a commercial — the full-length Be Legendary only has a few fleeting shots of his supplement collection and they were used to drive home a point: the road to greatness is paved with a lot of calories, a lot of injuries, and a lot of sacrifices. Image via Generation Iron Fitness & Bodybuilding Network on YouTube. The stated goal of the film is to showcase Pritchett’s training as he prepared for the 2017 Arnold Classic, where he intended to break Eddie Hall’s elephant bar deadlift record that he set at the 2016 Arnold Classic: 1,025 pounds (465kg). 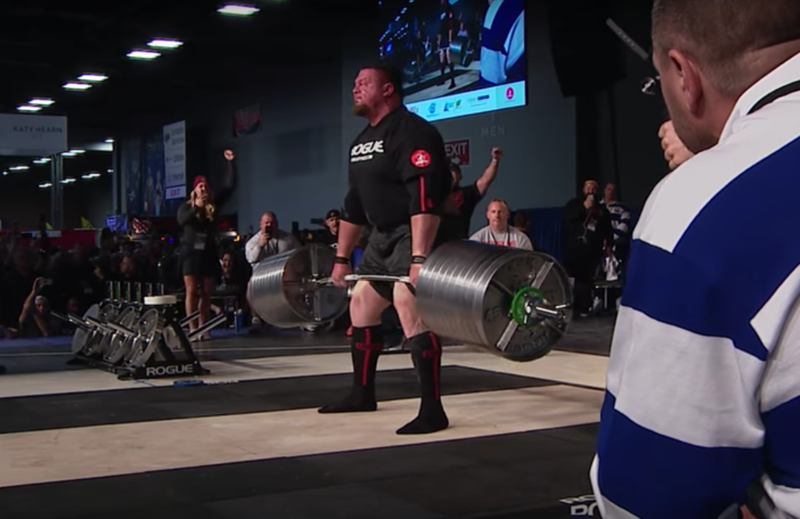 Along the way, we’re treated to interviews with Pritchett and his children, father, and wife, who all help to pull back the veil on the life of the professional strongman. And it ain’t easy. One of the more memorable interviews shows Pritchett soberly recounting his injuries: a partially torn patellar tendon, a partially torn quadricep tendon, a torn calf, a torn shoulder labrum, a torn hamstring, two torn biceps. This comes not long after his wife confesses that every time she watches her husband compete, she’s accompanied by an ever present fear of another injury. You can watch the film below, right here. While most of the interview subjects are quite reserved and are careful to not be too vulnerable on camera, the documentary is beautifully shot and should provide solid entertainment for fans of elite strongmen. For more of our favorite strength sports movies, check out our list of the twelve best strength sports movies, ranked. Featured image via Generation Iron Fitness & Bodybuilding Network on YouTube.